Grapher does not currently support inverted or reciprocal axis scales. But, you can create an axis that has the desired look using a combination of linked axes and worksheet labels. Create the original scatter plot from the XY data in the worksheet by clicking the Home | New Graph | Basic | Scatter Plot ( ) command. Select the data file and click Open. 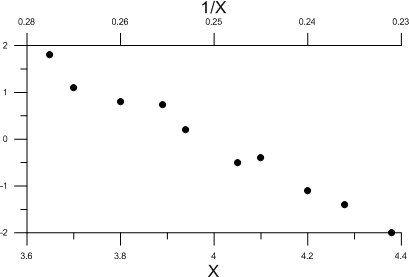 Click on the axis that should be inversed or the reciprocal of the current values. Click the Graph Tools | Add to Graph | Duplicate Axis command. Set the location for the duplicate axis and click OK. The duplicate axis is added to the graph. If you do not want to see the original axis, uncheck the box in the Object Manager next to the original axis. Click on the scatter plot to select it. Click the Graph Tools | Worksheet | Display command to open the worksheet that contains your plotted data. In a blank column, type the header X Value and then type the actual X values that are displayed as tick marks on the original axis. In the attached example, this is Column D.
In the next blank column, type the header X Label. Click the Data Tools | Data | Transform command. In the Transform equation, type the equation E=round(1/D,2). The E is the X Label column letter. The D is the X Value column label. The 2 is how many digits you want to be displayed in the label. Click OK. 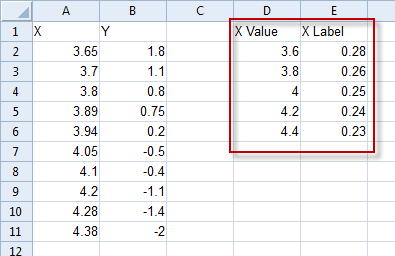 Type the X Value values into the column D.
Use the Transform command to generate the X Label values. Return to the plot window. Click on the second axis to select it. In the field next to Link axis, select the original axis. Check the box next to Link limits. Set the Limits Y = F(X) = value to X. Change the Worksheet to the worksheet that has the data and labels. Set the Data column to the column that contains the X Value, as defined in step 7. Set the Label column to the column that contains the X Label, as defined in step 8. The duplicate top axis now shows the 1/X labels.